Our chauffeur, Shalea Demeen Griggs, was the perfect person to spend our final hours of our wedding with. She was so personable and my husband and I truly enjoyed our conversations with her. I would highly recommend requesting her on your special evening. Their Limo Service was just what we needed for my daughter's big day. The driver was prompt, helpful and courteous. 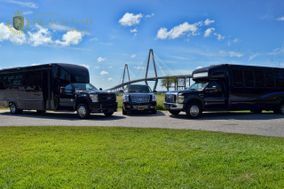 We hired Charleston Black Cab Company to transport my husband and I from our beach house/ceremony site on Folly Beach to our reception site in Charleston. Our driver was very patient with us as we ran behind schedule after our ceremony and taking pictures. He was very sweet helping me in and out of the car, making sure that I didn't step on or close the door on my wedding dress. He offered us bottled water during our ride and made sure that the car was cool enough for our liking. I highly recommend Charleston Black Cab Company!! Please everyone look no further than Charleston Cab Co.!! The party bus that we rented was amazing!!! The driver was on time and patient!! On the inside of the bus it was decorated with lights supplied with water and ice!! It made you feel like you were in a dance club! The speakers were state of the art, great sound!! We recommend EVERYONE to use Charleston Cab Co. for all your events especially wedding receptions! Hands down 5 Star treatment! Toan and Connie rolled out the red carpet for me and my guests! Toan was very accommodating and such a pleasure to work with! I am not sure where to begin praises for our amazing drivers Herbert and Robert!! Always on time,very kind with all our requests,sent text messages with any and all information needed for arrivals and pickups! This group is/was/are very professional and I look forward to many more future adventures with Charleston Black Cab Company. I’ve never had to book a limo service before so I wasn’t exactly sure how it worked. I had called several companies in the Charleston area and received quotes but none of them could provide me with exactly what I was looking for within the budget I wanted. A friend then suggested that I try Charleston Black Cab Company. I spoke with a very helpful man over the phone and he was able to provide me with everything I needed within my budget! Communication after that was also so easy. I had to make several changes as the wedding date grew closer and there was always someone to help and email me with a new breakdown of my services and timeline. On the wedding day, everything was perfect! We had the Krystal Koach party bus which was so much fun and even larger than I thought it would be. We had several stops to make and drop off spots and the drivers were always on time and ready for it all. I would highly recommend Charleston Black Cab Company to anyone needing a limo service in the Charleston area! Everything was as requested and the driver was extremely pleasant and responsive. They even included a bottle of champagne in a cooler as a surprise for us. One of the girls left something on the bus and we were promptly called afterward and the item was returned without problem. Very satisfactory. I arranged for a Charleston Black Cab to take my daughter and her new husband from the wedding reception to their hotel at the end of the evening. This company was very easy to work with; they confirmed details of the arrangement the day before the wedding; the car was lovely and clean and very roomy; and the driver was just wonderful. He helped load things in the car, and when the groom tried to tip him on reaching the hotel, he explained that he had already been tipped. A real class act. I loved Black Cab Company! I had a great experience on our wedding day with them and our driver Ron and would not change a thing. They were great to work with beforehand, as well. SO EASY to work with! Very professional and VERY PATIENT driver. This company is excellent and the cars are beautiful! The car was so cute! They arrive on time and even put on a "Just married" sign I made. The drive took us around the city and let us just relax. It was a nice end to the evening! Charleston black cab took my wedding party of 22 to the chruch and from the church to the reception. They then picked up me and my husband at the end of the night. They were on time, punctual, and very nice to deal with. I would recommend them to those of you getting married in Charleston. They were there early and our driver was so nice! He made sure that we were able to get into our hotel before leaving (it was late and the front door was locked and we couldn't get a hold of anybody). Very professional and would recommend instead of a limo! Charleston Black Cab co. was wonderful to work with. They were very good about returning phone calls and emails, and called a few days before the wedding to just "confirm" all the details. The person who took us to our B&B after our wedding was so sweet, and helped carry things up to our room for us. They were wonderful to work with, and so much more stylish than just a regular cab! Our wedding was 9/24/2011!! One of our wedding planners recommended Charleston Black Cab Company. There coordinator Chesley was professional in setting up our contract and even confirmed with us the week of the wedding. Our entire wedding events was located at one event, but my husband and I wanted to go off on our own to take pictures near the waterfront. The cab was sleek and innovative enough to fit my husband, our two photographers, me, and my big dress bella in the cab. I am so glad I booked Charleston Black Cab company for my get away car. Working with the office staff was a breeze, my driver was right on time, and extremely polite and professional. The car looked amazing and was really unique. I loved that we only had to book for 1 hour rather than the typical 3 with a limo company. I couldn't have been happier with our wedding exit! Very professional & well worth the money! I had a lot of out of town guests & had the Black Cab Company pick up my guests from their hotels. This service provided my guests a safe ride to and from the wedding so they could enjoy themselves and not have to worry about driving in a city in which they are not familiar. Thanks Black Cab Company for helping provide myself and my guests a great service!! On time, professional and affordable. That's exactly what we got. The black cab we had was cute and perfect for our get away car. Personally, I am not big on limos. This was more intimate and fun. Thanks Black Cab! We used Charleston Black Cab for our transportation for our guests from the hotel to the ceremony/reception and back later that evening. For the folks who took the smaller British style cabs, they loved them and found them super roomy! Everyone was really happy with the transportation and we were happy with the flexibility and value. Would recommend to anyone! Scott was easy to work with, and we were very pleased with the quality of service. We used the big shuttle to get people from the hotel to church to reception. They were on time and extremely nice. Very accommodating. They even took people downtown after the reception! This should be the only transportation you should use. We used a London black cab for our wedding day transportation from the ceremony to the reception. The company was super nice to work with and the black cab looked great in our wedding photos. Great Service! They were right on time. Very Polite and flexible. We switched our plan last minute and they were very understanding and accommodating.